Welcome to the doTERRA print store hosted by Tank Prints! Your one stop shop for doTERRA business card templates. Cards start at $39.99 for 250. Why buy from us vs our competition? Trust our 4000+ positive reviews! - doTERRA-approved designs! Don't worry about being out of compliance. - Lightning Fast Shipping. Receive your cards in 5 business days or less. - Have a question? Our live online chat is available everyday from 10am - 1am central time. - Over 3700+ certified reviews! *If you aren't convinced after receiving your cards that these are the best cards you've ever purchased, return the cards and we will offer your money back or a free reprint, no questions asked. *Try getting that guarantee from VistaPrint! My Doterra business cards are amazing. The colors are vibrant and very eye catching. I already received compliments on how they look compared to another website. Thanks so much!!! I was very pleased with my cards.....very well done all around. Will be happy to hand these out to people. I have received so many compliments on my new cards. The layout is eye catching, the colors vibrant and I love them! Thanks!! Wellness advocates have been wondering where to purchase their cards. 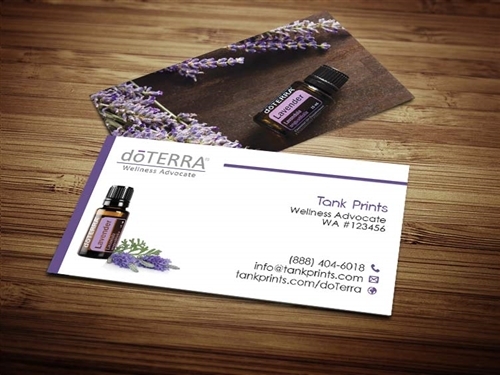 At Tank Prints we service many Network Marketing brands and doTERRA is one of our favorites. Each individual card has been designed to make an impact on your potential customer. Think about it; you purchase business cards to get business. A business card needs to attract, it needs to be memorable, it needs to be able to withstand the elements. Our cards fit all criteria. With over 1000 positive reviews and thousands and of customers, we have been helping network marketers and independent distributors achieve that sale.